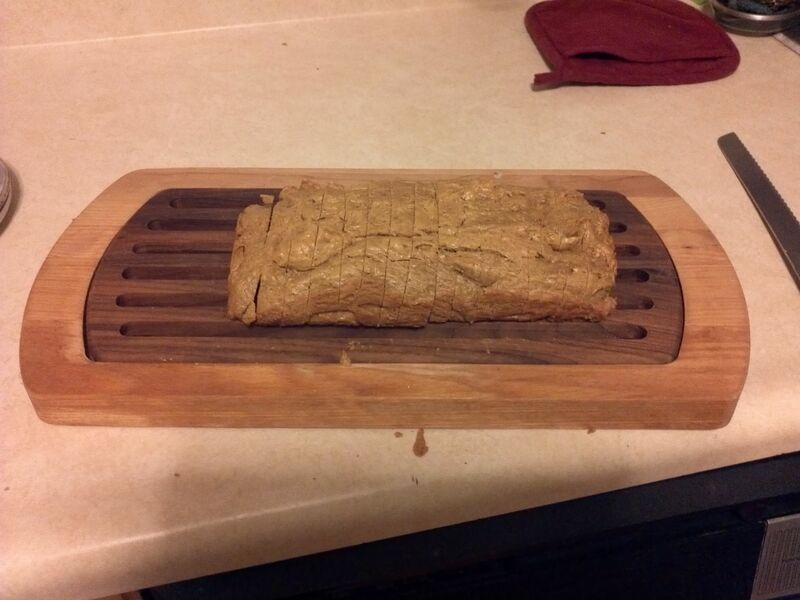 Ahh peanut butter bread. This is a very controversial faux bread because of the high number of carbs is contains. It has to be included because it is by far one of the most popular and often the first entry into low carb baking for the new keto inductee. Personally, I think its good for an occasional snack or as an accessory to a meal, but I would not start making daily sandwiches out of it. Don’t get me wrong, the taste is spot on, but even sliced very thin like my version below, it rings in at 2.5g of net carbs. I didn’t get a chance to take many pictures with this one, so lets get started! The process for this one just involves throwing all the ingredients into a stand mixer and going at it. It will look strange in the bread pan and very low. It doesn’t rise much so for larger slices you would need a narrower bread pan to get a different geometry. I think this is really alright because if the slices were twice as big, it would be 5g of carbs per slice, as much as 10 for a sandwich. I cut this into 16 slices because it is an easy method. Just cut it in half, then in half, then in half, then one more time! 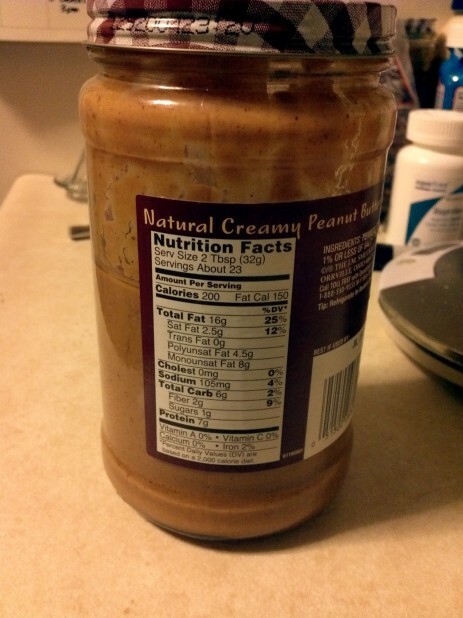 Make sure you buy the lowest carb peanut butter as possible. In this case I used Smuckers Natural Peanut Butter Creamy. This one is 6 carbs and 2 fiber for 2T. Some other brands will get tricky and list only 1T as the serving size to make it confusing. If you find a lower one, post it in the comments! If you haven’t used low carb peanut butter before, it will be separated and that is normal, just stir it back together before use. Here is an example of employing the peanut butter bread in an open faced sandwich. My general meal for the day was tuna salad. I took a slice of cheese and cut it in half. Then put one half on the bottom, tuna salad, and then the other half of the slice all on top of the peanut butter bread. 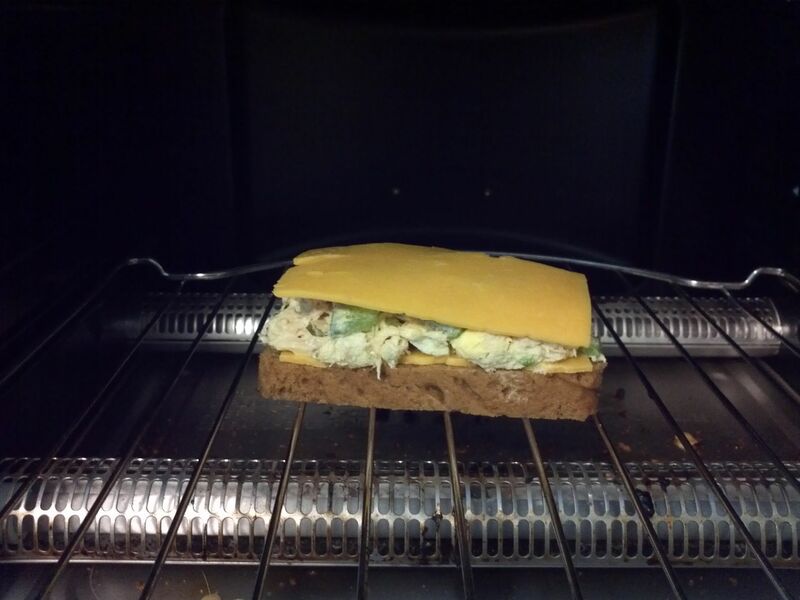 I cooked this in my convection toaster oven. I am home most days for lunch so I toast just about everything. Microwaves are nice for heating up quickly but it doesn’t melt cheese or work with bread very well. Here is a picture of the finished product. I had a lot of tuna salad so I also made a stuffed pepper tuna salad and just regular tuna salad. 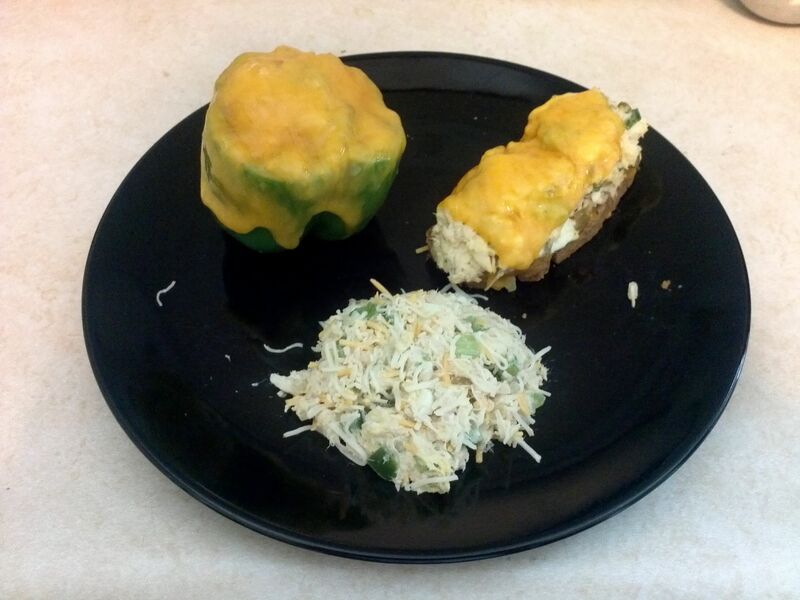 For the stuffed pepper, I cooked it in the toaster oven for about 15 minutes with convection and then put the cheese on at the end. I just found this through a pinterest link… Curious- would PB2 work?? I’v been DYING for some bread again.. especially for a tuna sandwich! I came across this and made it this morning. Was pretty disappointed. It’s so.. flat. It’s maybe an inch thick? I used a standard size bread pan.. Definitely can’t make a sandwich out of it! I like to double the recipe and use a normal sized pan. 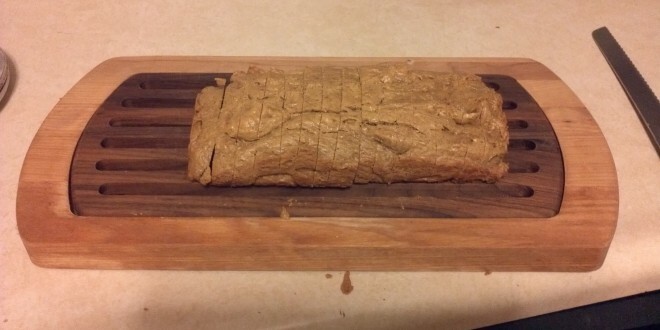 Everything is the same, including the cooking time, and it comes out more like a normal loaf for slicing. This looks so good!. I really love your recipes!. Pingback: So if it looks like bread… | This Adventurous Life!